Bass fishing equipment has made unreal advancements in my lifetime. When my uncles took me fishing in my preteen years we went in wooden jon boats, usually homemade, and paddled them around ponds and backwaters of Clarks Hill. Fishing was always close to where we put in, paddling very far was too hard. My job was to scull the boat, working the paddle quietly without taking it out of the water, while my one of my uncles fished from the front of the boat. Maneuvering around was difficult and we fished slowly. 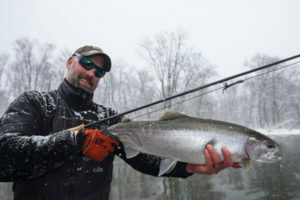 Sometimes, if I was lucky, I got to make a few casts with my trusty Mitchell 300 spinning reel while my uncle paddled. Line was a black braid that broke all to easily, or the new-fangled monofilament line that was stiff, weak and hard to tie. Lures were wooden, hand painted creations like Jitterbugs, Hula Poppers or Lazy Ikes. Sometimes we fished a Crème “rubber” worm with a two or three hook harness and a small spinner up front. They came in two colors, black or red. We used the paddle for a depthfinder and usually fished water where it would touch the bottom. Fish were kept on stringers, either metal chains with clips or cords with a ring at one end and a metal shaft on the other. All fish were kept to eat. Now bass boats fly over the water at amazing speeds while electronics show depth, water temperature and exactly what is under and out to the side of the boat, like looking at a picture. Rods and reels are light and trouble free and line comes in so many choices it gets confusing. You need only to walk into Berry’s Sporting Goods to see the vast array of shapes, color and sizes of plastic worms and huge numbers of hard baits that will run from the top down to more than 30 feet. And they come in colors that look exactly like bait. Bass are put in live wells with pumps that keep fresh water circulating to keep the fish alive, and almost all are released. Pictures are taken with cell phones to share with hundreds of people on social media. And you can win money in tournaments. But what is the most important advancement for actual fishing. There are discussions of this in magazines and on-line. People have varying ideas but to me, without a doubt, the most important improvement is the foot-controlled trolling motor on the front of the boat. You can sit or stand on the front of the boat and, with practice, move the boat precisely, without even thinking about what you are doing, while casting. You can go into tight places quietly and cast to spots that would be inaccessible without the trolling motor. What do you think the most important of all those changes over the past 60 years? This entry was posted in Fishing Tackle on January 30, 2018 by ronniegarrison. Last Saturday the Potato Creek Bassmasters held our January tournament at Sinclair. In seven hours of casting in the cold and wind, 12 fishermen landed 32 bass weighing 68 pounds. There were four bass weighing more than five pounds each! Doug Acree won with five weighing 12.80 pounds, Raymond English placed second with five at 9.14 pounds, Richard Dixon was third with five weighing 8.58 pounds and Mike Cox came in fourth with three weighing 7.72 pounds. Tom Tanner drove up from Florida to catch one bass, but it was the right one, weighing 6.13 pounds for big fish. I guess I used up all my luck the week before at Jackson. I had taken my boat to “Lanier Jim” in Gainesville to run dedicated wires to my front depthfinders to try to get rid of interference from the trolling motor. When I got home that night I noticed my circuit breakers were flipped so I re-set them. Everything seemed to work ok.
My first stop Saturday I put my trolling motor down and nothing happened, it had no power. The wind blew me against a dock and I checked everything I could think of, first re-setting the circuit breakers, since that is a common problem. Nothing helped. During the day I tried to fish, letting the wind blow me down banks when it was in the right direction and putting down the power poles to hold the boat in one place when it was shallow enough. It was very frustrating. At 9:00 as I blew toward a tree in the water I cast a jig and pig to it. Just before the boat hit the tree I felt a bite and landed a three-pound largemouth. That was the only good thing that happened all day! Not long before weigh-in I set my power poles near a dock and cast around it. I felt a thump in a brush pile and brought in half a worm when I set the hook. After putting on a new one I cast under the dock. At the angle I was sitting I could not really see my line. Slowly pulling my worm, I felt resistance but thought I was over a board on the dock, and I was, but it pulled back. A bass had sucked in my worm and I was trying to pull it over the board. By the time I realized it was a fish and set the hook it was too late, and I missed it. That was a terrible start to my year in that club. I hope my luck is better at Sinclair today in the Sportsmans Club tournament at Sinclair. At least the weather is supposed to be much better. 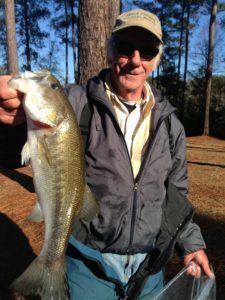 This entry was posted in Bass Fishing on January 28, 2018 by ronniegarrison.